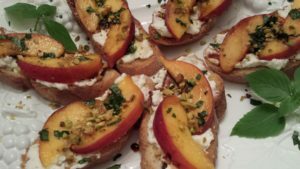 Peach Pistachio Ricotta Toasts. Summer is peach season. There’s nothing tastier than a fresh ripe peach at its best. 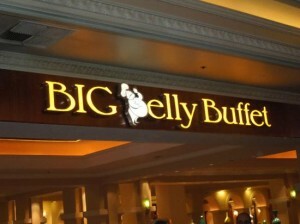 I wanted to serve a nice elegant appetizer one evening when we had dinner guests. And I’m on a peach theme nowadays. 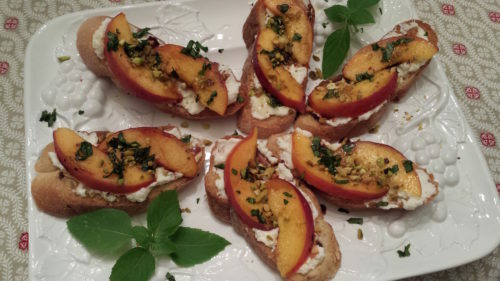 So Peach Pistachio Ricotta Toasts received top billing on my menu. 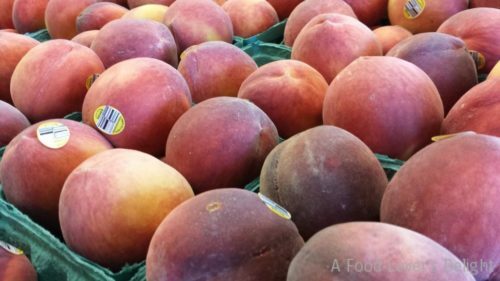 Usually I find two or three ripe peaches that are stellar out of a dozen purchased peaches. It’s hard to find a good peach around here. I use the mealy and somewhat sour peaches in my Cucumber Peach Mint Smoothie recipe. Recently, I made my own ricotta cheese. As expected, it was pretty simple and tasted so good. You can order a cheese making kit if you want to make your own. 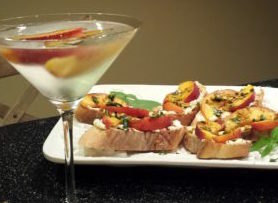 I used the fresh ricotta cheese that I made as a base spread for these toasts. You can make your own ricotta or purchase ricotta at the grocery store. So…what to do with this wonderful ricotta that I made? 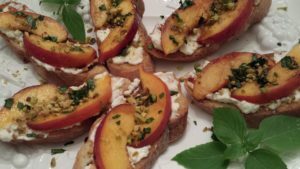 Why not spread it on a toasted baguette and top with ripe peach slices, chopped toasted pistachios, cinnamon basil chiffonade, and a drizzle of honey? 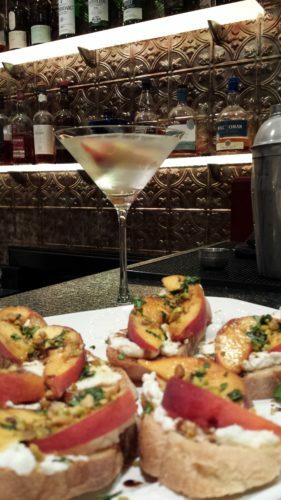 Also, you can serve sparkling water or champagne in a glass with a sliced peach as garnish. 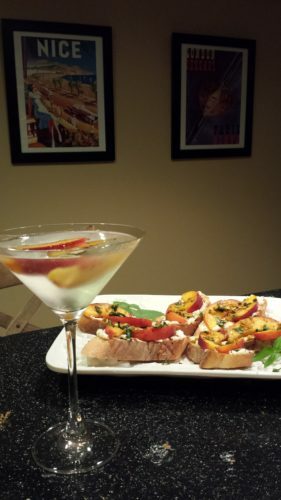 I made a White Peach Cosmopolitan martini for the ladies to go along with this appetizer. 2. When broiler is ready, toast the baguettes on each side until light brown. 3. Let the toasted baguette slices cool for a minute. 4. Spread ricotta on each toasted baguette slice and arrange the slices on a serving platter. 5. Divide the peach slices amongst the baguette slices on top of the ricotta spread. 6. Sprinkle the chopped toasted pistachios over the peach slices. 7. 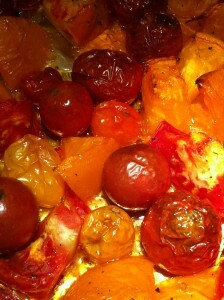 Sprinkle the cinnamon basil chiffonade over the peach slices. 8. Drizzle the peach pistachio ricotta toasts with honey. Makes 12 appetizers. Serve alongside your favorite beverages such as a chilled rose wine, a nice gin martini, or my White Peach Cosmopolitan Martini or Non-alcoholic White Peach Refresher. Variations: Use nectarine slices instead of peaches. Substitute softened cream cheese for the ricotta. Use regular basil if you can’t find cinnamon basil. Use toasted pecans if you can’t find toasted pistachios. For a zesty taste, add some cracked black pepper on top. Add some crispy prosciutto ham on top for a savory flavor.